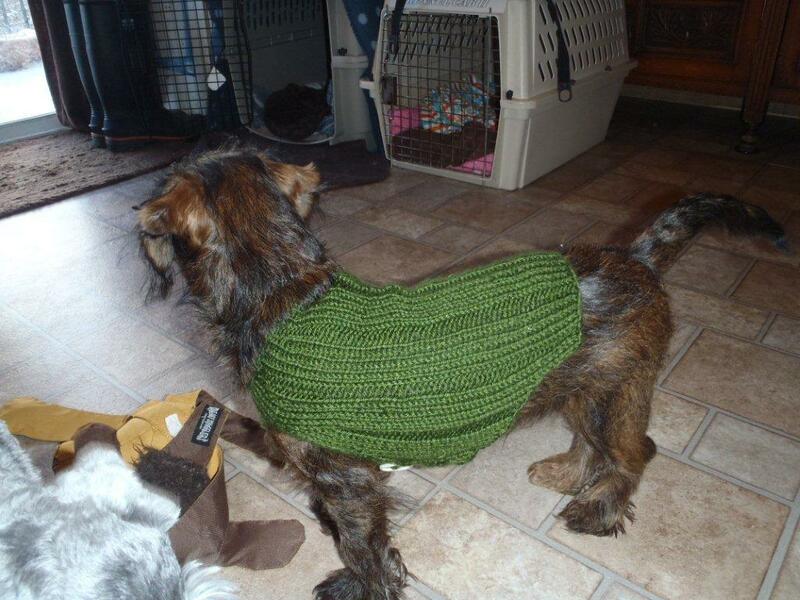 For Charlie’s 2nd Sweater I used the Drops 102-45 Dog Coat pattern and Red Heart Soft Touch in a dark green. This sweater is knit in the round for the neck and then separated for the back and the underside. It then is closed by buttoning the back to the underside. It is easier to get on Charlie than the first sweater I made him, but the buttons are at the very bottom, so if you have an excited puppy it can be a little troublesome to find them. The back of the sweater called for cleaning up the edges with crochet. I left them without and they’re a little uneven but acceptable. Inca wanted to get in on the modelling action too. She’s a bit bigger than Charlie and has considerably more hair, so it fits a bit more snugly on her. There are no pictures of Fidget, because he prefers when we don’t try to put clothes on him. 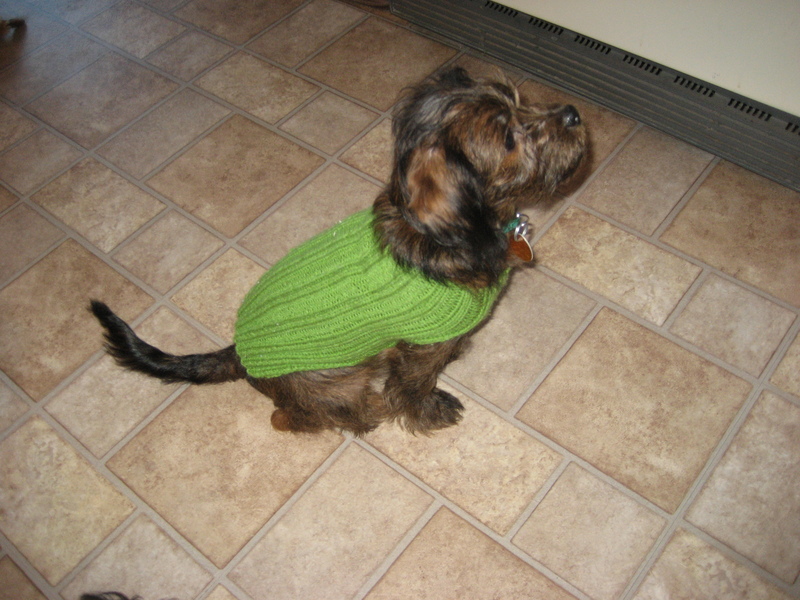 There are a few more pics on my Ravelry Project Page of the puppies in this sweater. Last Thursday I started work on my first 12 in 2011 project, a pair of plain vanilla socks in Rabbitworks Fibre Studio Toe Jam in the popular Revenge colourway. 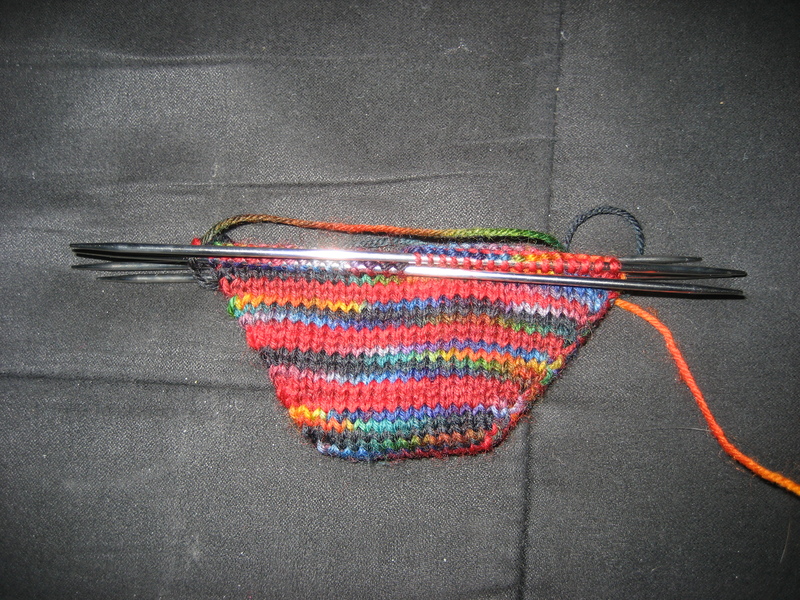 As usual with socks for me, I’m using Wendy’s Generic Toe-Up Sock Pattern and short-rowing 10 stitches on each side of the toe and heel. I bought this yarn at the Victoria Fibre Festival either two summers ago or three, and the skeins have been sitting in my stash looking gorgeous ever since. It seems that’s become the habit for what happens with most of my sock yarn. I took this photo shortly after I started working on the socks. I’m now up to the ribbing on the first sock. I can’t remember the last time I worked this quickly on a pair of socks. I think it’s because socks are something I can knit while Charlie is snoozing on my lap, bigger projects tend to wake him up and then he tries to eat the yarn, needles, knitted fabric, row counter…. you get the idea. Plus I was home sick earlier this week so I had some knitting time but I didn’t want anything complicated to work on. 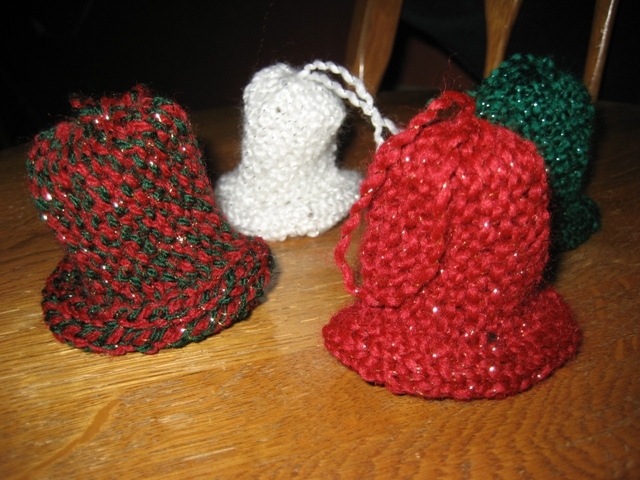 For Christmas 2010 I made four projects. With Charlie around there hasn’t been as much time to knit, so I didn’t want to commit to knitting a bunch of deadline knitting. The first is a Stocking for Everett, the newest addition to our extended family. It matches the one I made for his sister, Annora, a few years ago except that while her’s was predominately white, Everett’s is mostly red. 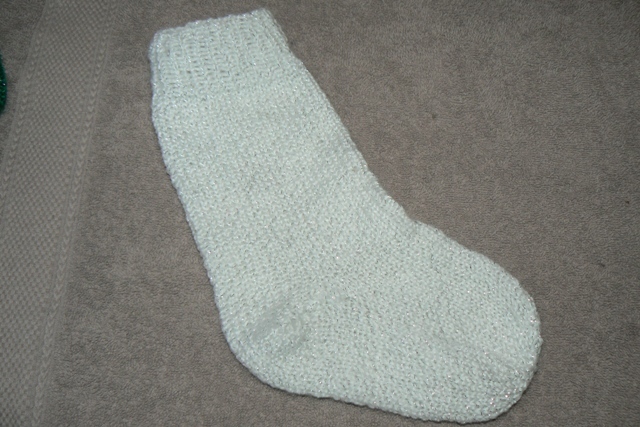 It`s made out of Red Heart Soft Touch and I used just a basic sock formula with a short-row heel and gathered toe. The only under the tree present that I made were Dad’s 13th Socks. 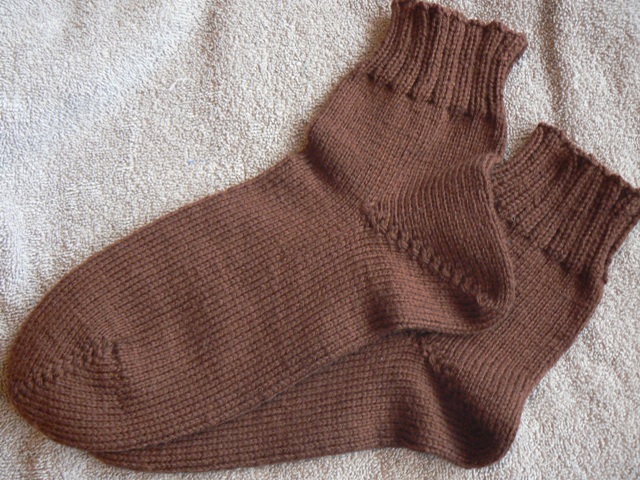 These are the same as Dad’s 12th Socks that I finished a few months ago, made out of Knit Picks Stroll Sport. This is one of the few Christmases that Dad has been given socks without needles attached. As a last minute gift I made a few of my co-workers Christmas Bell Ornaments. They were made from bits for Mom’s stash of Christmas Acrylic and each takes about an hour from start to finish. I managed the four that I made in less than 24 hours. 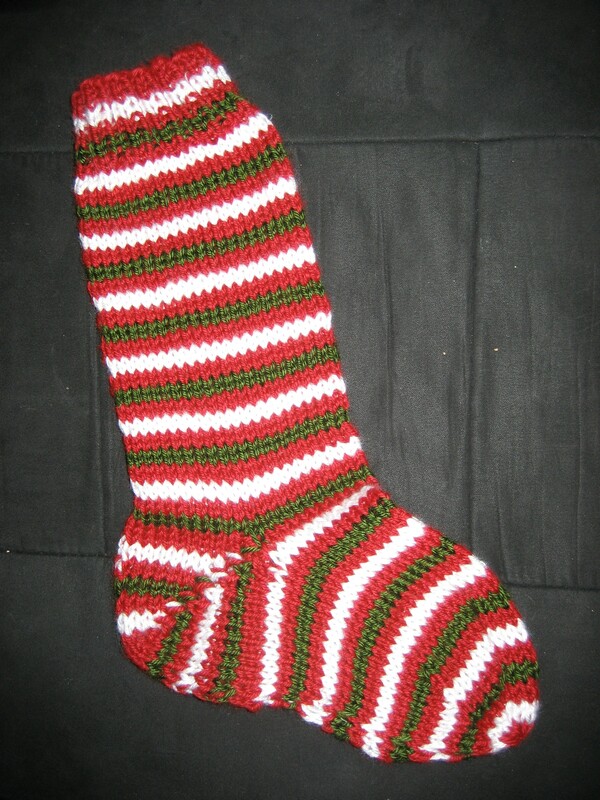 The final Christmas project I made was a Stocking for Inca, my parent’s new puppy. Mom started a stocking for Charlie but was running low on time so I offered to help out by making one for Inca. I finished it up on Christmas Eve. Now the dogs have matching stockings, Inca’s is white, Charlie’s is green, and Fidget’s is red. 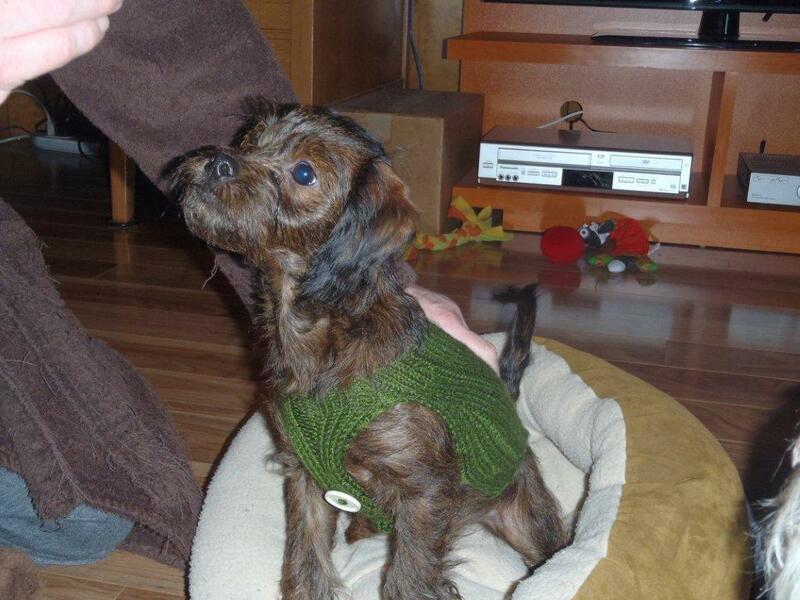 One of the reasons that I have been absent for the past few months is that I got a puppy at the end of October. Meet Charlie. I went to meet Charlie after hearing all about his sister, Azzy, who lives next door to my parents. 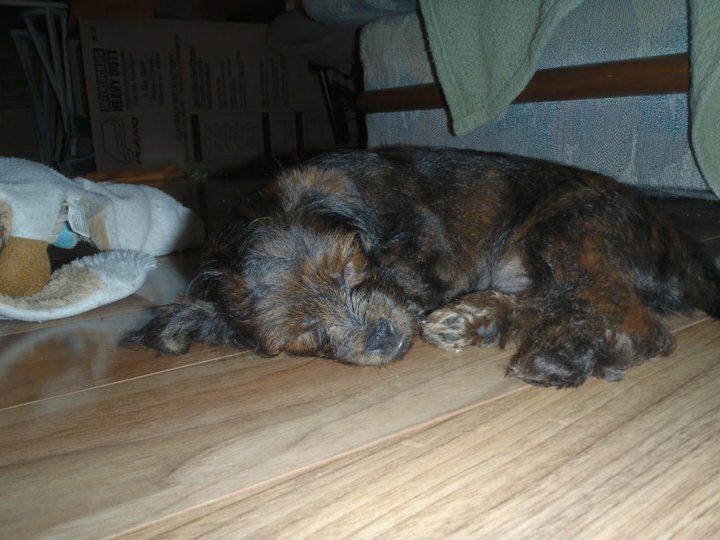 He was born on August 28, 2010 and came to live with me on October 29, 2010. I love having a dog and I think Charlie likes how quiet our house is after being born in one with 5 children (to clarify, I mean 5 human children in addition to the 5 other puppies). What breed is he? – His mom is a Shih-Tzu Yorkie Cross and his dad is a Miniature Poodle. I like to call him a York-Tzu Poo. How big will he get? – Honestly, I’m not too sure. Right now he’s almost 19 weeks old and is about 9 lbs. He’s gained about 4 lbs since I got him. Charlie’s mom is more Shih-Tzu sized than Yorkie sized, and he’s already not a tiny dog. I think at most he will weigh 14 lbs when he’s full grown. So he’ll be small but not super small. Where did you get him and are there anymore? 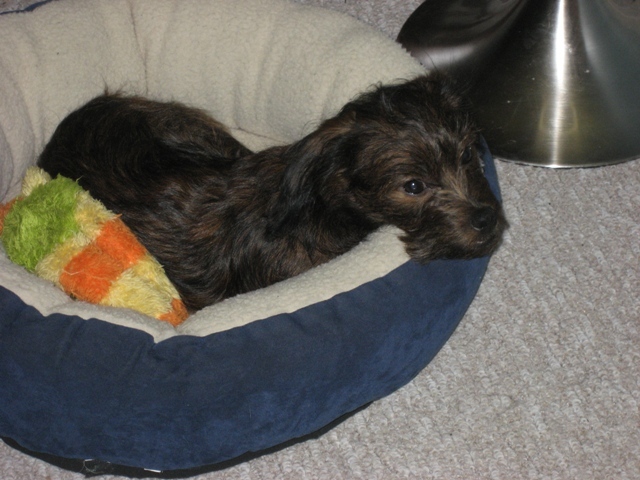 – I got him from a private breeder in the Cowichan Valley and all the puppies have homes. Charlie and Azzy are the only dogs in the litter of 6 that took after their mom more than their dad, the rest have curly poodle hair, so Charlie’s a fairly unique puppy. Yorkies have a tendency to feel the cold when outdoors and Charlie has inherited that in his mix. So of course I’ve made him something to keep him warm. The first sweater I made was Easy Dog Sweater by Talking Tails. It lived up to it’s name as it was very easy to make. I did Charlie’s in all rib so that I could make it a bit bigger and he could wear it for longer. I made it smaller by using the directions as written but using sport weight yarn instead of worsted. It’s a good sweater but it is set up so that you need to put on over the dog’s head and then put his feet through the leg holes, which is not always the easiest. Lucky for me Charlie is good about having clothes put on him as he played doll with the kids at the home where he was born. 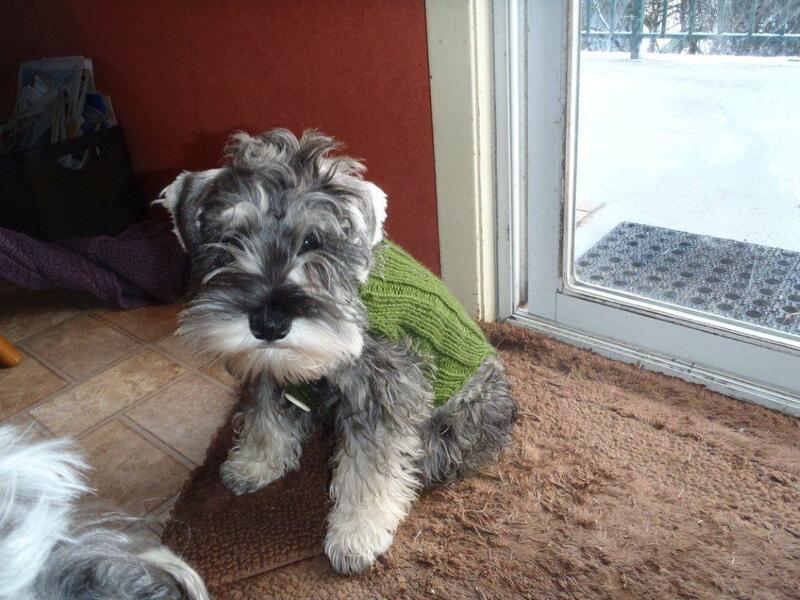 There are a few different pics of Charlie in his sweater on the Ravelry Page for this sweater. The first photo in the post was taken this morning and the one below was taken when I first brought him home. I can’t believe how much he’s grown! I don’t normally do the whole resolution thing but this year feels different. I want to make some changes to how I do things and a few simple resolutions seem to be a good way to start. 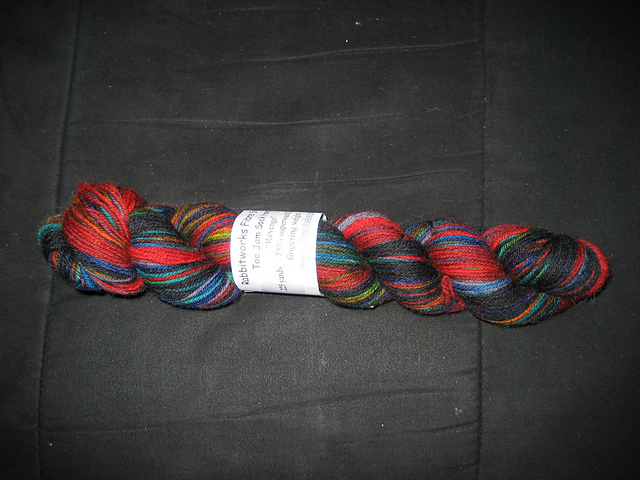 I’ve joined the 12 in 2011 group on Ravelry to help use up some stash and hopefully stay focused. I have so many things planned that I really want to make so it’s about time I got to them. I want to keep the number of WIPs I have to three or less. I tend to work on one thing pretty consistently anyways so if I can manage this then nothing should be left unfinished for years, like my Celtic Tote. To keep better records of what I’m doing using this blog and the movie and book lists. I used to be a lot better at it so it’s time to get into the habit again. Part of this will be to document all of my stash on Ravelry, I know there is yarn in there that I don’t even remember that I have. I want to knit more for charity. As a start I plan on making one baby hat a month for the Anglican Church Women’s Dorcas Program, which works to send warm knits to families in need in Northern BC. My Grandma has been knitting for this initiative for years and she is working to make a baby layette a month this year.